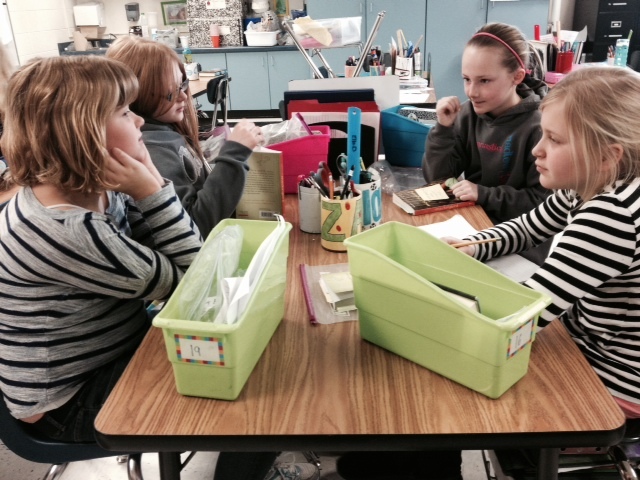 I am drifting around my classroom listening in on the book club conversations happening during reading. Some times I stop and guide, other times I just listen, smile and move on. What a glorious sight indeed, 26 students discussing their books. It wasn’t always this way in my room. I remember the days of guided reading, teacher front and center, and the students skimming the surface of their books waiting for their turn to read aloud. I remember the times when 2 children dominated every conversation and others just watched. Or the time when I thought book clubs meant I had to have all of the questions prepared in all of the books. Gone are those days and thank goodness they are. So how did we get to this stage, because I can tell you it didn’t just happen by magic! We started the first day of school. The very first thing I did in my classroom was read aloud a book and ask my students to discuss it. Everything we have built off started that day. We set the goal beyond school. I don’t want my students to have deep conversations to get a good reading grade, I want them to be able to have meaningful conversations about anything in life. The goal is bigger than 5th grade and the students get that. I gave them a timeline. I told the students that later in the year we would be in book clubs and so everything we were practicing in reading led up to this; real “adult” conversations about books. We practiced. Deep conversations don’t just happen so we practiced with every read aloud. That way the students had a shared experience to discuss without it taking up much time. Practice wasn’t just out loud, students would also write down what their response would be on post-its, thus allowing everyone a chance to be a part of the conversation. We built off each other. Younger readers tend to state their opinion without really listening to what has been said before them. I modeled how to build off what has just been said and students then practiced every chance we got. We did it across subjects. Creating great discussions isn’t contained to just reading but is something we need in all subjects because it is a life skill. We have many discussions across the board and they all practice the same skills with the goal of pushing our thoughts deeper. We created cheat sheets. Students don’t always know what questions to ask to push a conversation so we created cheat cards together; little note cards with printed questions that they could refer to anytime they want. I stopped talking. Rather than lead the conversation, I am now on the side coaching in and helping when needed. I also have a designated weekly time set aside for each book club so that I can really see how it is going and help as needed. It has been wonderful to see the clubs grow. They picked the book. And abandoned the book if needed. Just as every book doesn’t work as a read aloud, every bookd doesn’t work as a book club book either. Students had about 12 different books to choose between and gave me a top 4. Each group knows they can abandon the book if it does not live up to their expectations but that it needs to be a shared experience. They set the expectations and the pace. Before we started reading, all groups met to create the expectations within their group. They discussed what they should look like, sound like, and feel like and then created a poster. All the posters are different based on the group. 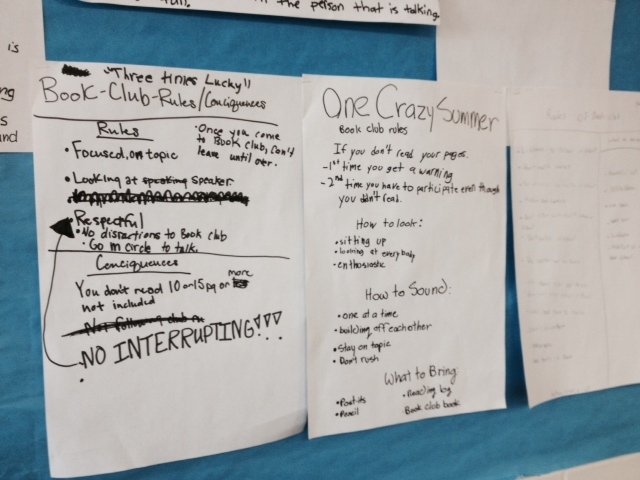 The groups also decide how many pages they are going to read every day, leading to 100% completion and buy-in. My students know that book clubs are their chance to show off everything they have learned in reading, but also that it is bigger than that. Book clubs are not just reading and discussing a shared book, it is about growing as a person. I am so proud of my students and what they are accomplishing. Next postIs it Okay That 5% Don’t Get It? 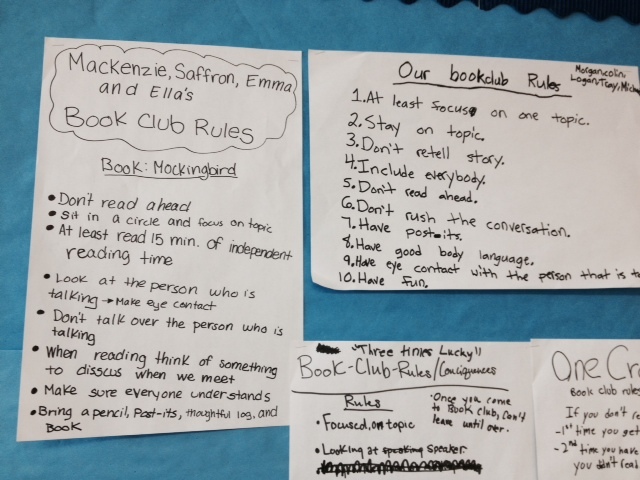 We start our book clubs in the next week in third grade and like you we have been practicing all year. I would love to see your cheat sheet, as I know some of my kids will want that support. Reblogged this on The Restless Library. I love that you let your kids pick and abandon nooks if necessary. I cannot even begin to say how many times I picked a book for school and became stuck with it because the teacher would not let me switch. You raise some very good points, I will have to share them with all the teacher I know.